If you’ve never chosen a sink before you’re unlikely to understand the amount of work that goes into the process of making this decision. With the average bathroom renovation costing 5 figures, you don’t want to get it wrong either. Today we’re going to look at the biggest considerations for sink choices. We’ll be working off the assumption that you’re using a single sink, as this is most common. The advice is easily adaptable to multi-basin setups as well though. The first big choice is what type of sink you want. Here’s a quick rundown of the main ones. Drop in sinks are those which sit inside a countertop with the top part visible just above it. The sink is literally placed in the top of the counter, giving it the ‘drop in’ name. These are the most common types of sink. Undermount sinks are fitted in the same kind of location as a drop in – the top of a cabinet. This time though, they’re fitted entirely from underneath the counter surface, being mounted beneath it. The finished look leaves a flat countertop which can be easily wiped, with any bits falling into the sink. Wall Mounted sinks ignore the cabinet entirely and are directly attached to the wall. This can be great if targeting a specific style in your bathroom, or if floor space is an issue for you. Pedestal sinks are those which don’t have a cabinet, but which stand on a ‘column’. This column usually hides the pipework, making this type of sink less work than something like a wall mounted one. It gives you more floor space than a cabinet too, so it can be a good middle ground. Vessel sinks are custom designed creations which come with their own specially designed faucets. These can be almost any shape, size or design so they’re perfect for anybody wanting to build a perfect, stylish bathroom and who has the budget to afford one. Vanity sinks are like a mid-point between a drop in and an undermount sink. It uses the top of the cabinet as the top of the sink, so the sink is usually built in as part of the cabinet top. This gives the best of both worlds but can cost a little extra too. Places like Unique Vanities give a good range of sinks like this and other styles. 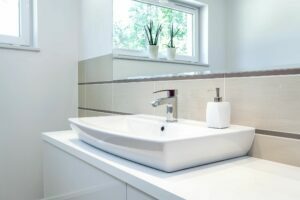 The material of your sink has a big effect on how it looks in your bathroom too. The look is usually the biggest factor but budget plays a part too. Different materials do have different characteristics too. Cast iron tends to be heavy and very hard-wearing, capable of standing up to a lot of damage without showing any marks or deformation. Porcelain is a lot easier to clean, but at the price of being more fragile than iron – although it usually won’t be an issue if you’re sensible. Stone or granite sinks are also very durable and have a more unique appearance, while there are other specialist materials for different appearances as well, including fireclay and tempered glass designs. Of course, the old stainless steel sink works just fine for many bathrooms too. Depending on your choice in a sink, you may need to modify your faucet setup as well. An under-mounted sink usually needs separate faucets for example, whilst a wall mounted one will need a wall mounted faucet to go with it. Once you have the location decided, you still need to pick the faucets. Again, the material is important as is the choice of having separate faucets or mixer tap. The design of faucet should also be compatible with the sink you’ve chosen – remember that some special designs, like the vanity styles, might need a certain faucet to work properly.